Spring is really here everything is getting green and all the spring plants are in bloom. What a beautiful day for you to take a drive to the country. We are just having our coffee out here on the patio so come on back and join us. The other day Sno White of Finding Joy In My Kitchen stopped by and asked me how many people I cooked for every week. Usually it's just me and Honey Bunny, but a lot of the time someone just drops by about meal time, because they know I can always fill an extra plate at my table. On holidays it is not unusual to have 30 or more.In the summer on week ends when family and friends are coming to the lake, it could be from 4 to 40. My leftovers are planned and we either have them the next day for lunch or it goes in the freezer. I make up freezer meals for my husband, so when he works outside the home, he just grabs a dinner from the freezer and he is set. Well you know me I just go on and on, we better get to that menu. I sure am glad you came to spend the day in the country with us we always look forward to your visits. 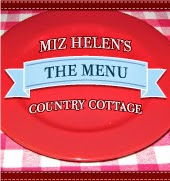 Wow, Miz Helen, this looks delicious! Wish I could join your dinner table for this! The ingredients sounds so flavourful! The cumin and chiles with the fish sounds like a winning combination! You had me at chowder :) I love chowders, and this one looks just simply amazing. I love the addition of tilapia. I am definitely going to try this. Thanks for sharing! You're right, Miz Helen. A little bit of this would totally make me feel better...but I don't think I could just eat a little. BTW - your blog has jumped in rankings. Thought you might want to know. I have been looking for some delicious ways to add more fish to my menu. This looks fantastic and I love the southwest flavors! Thanks for sharing this with us on The Hearth and Soul Hop! Thank you so much for sharing this I was looking for a new way to cook Tilapia I knew I could count on you please link up with me today if you have time. That chowder looks so flavorful (and colorful)! That looks really good! I'm sure my husband would love it! Unfortunately I can't eat dairy, so I wonder how it would taste with some kind of milk substitute. Probably really weird, but it might be worth a try! I think that this would be delicious with Coconut Milk and you could use a little corn starch to thicken it if you want it to be thicker. Your chowder looks and sounds fantastic. I can almost smell it simmering. I love the idea of using tilapia and would never have thought it was firm enough to be able to hold up in a chowder....lovely. Thanks for sharing at Hearth and Soul Hop! You do not know how many times I visit a linky party, pick out a recipe that looks good, click on it and land here! You are full of yummy ideas! This looks delicious. I am always looking for ways to get my family to eat more fish and I think this might be a great recipe to try out. I found you on the What's on the Menu Linky Party and i so glad I did. My kind of chowder! I think I really need to try this. Have never made chowder!